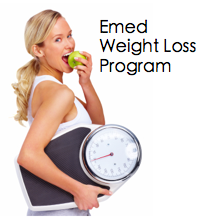 Emed introduces its 6 Week and 10 Week Weight Loss Programs! Emed’s Weight Loss Program is based on the effective, evidence-based, Shake It – high protein, low refined carbohydrate eating program. The Shake It Program helps to switch on natural fat burning processes in your body to achieve lasting fat loss and improved metabolic health. As part of your Weight Loss Program, you will receive one meal replacement shake and one snack bar per day to make the process as easy as possible for you. Your Emed Practitioner will tailor your program specifically to suit your individual health needs taking into consideration your body, lifestyle, health objectives, health issues and capabilities, personal tolerances, allergies, medications, age and other circumstances. They will also make additional dietary, exercise and supplement recommendations for you if required. Cost of any extra supplements is additional to Weight Loss Package price. Once you have signed up to Emed’s Weight Loss Program, you will receive thorough and personalised Practitioner support, motivation and guidance the whole way through your program, as well as interesting and applicable support material. This includes online resources, information and recipe booklets and a Emed Weight Loss Program Supplement Pack. Feeling energised and light, inside and out! Why is it so Important to Lose Excess Weight? Rates of obesity are skyrocketing and overweight individuals now represent the majority of the Australian population. Being overweight throws your entire body into chaos, creating an inflammatory environment which contributes to cellular disfunction, metabolic disturbances and ultimately, chronic disease. It is well-established that obesity increases your risk of almost every chronic and debilitating disease including cardiovascular disease and heart attacks, diabetes, arthritis, cancer, reproductive problems and more. So, instead of admitting defeat and putting up with a poor quality of life you don’t deserve, suffering from aches and pains, constant fatigue and daily limitations – take control of your health and get your lust for life back with this fail-proof program. Throughout this time you will have eConsults with your Emed Integrative Medicine Practitioner. Consultations are included in your Weight Loss Package to provide you with the benefits and support of talking with a qualified Emed Practitioner without having to pay exorbitant prices or leave your home or office. E-Consults connect you with your Emed Practitioner via Skype or telephone at a time which is convenient for you and take approximately 15 to 20 minutes of your time each fortnight. Your first E-Consult will take approximately 45 minutes, as it is classified as an Initial E-Consult. During each Consult, your Practitioner will guide you through your Program and provide you with information and help regarding your diet, exercise, supplements and dosage instructions. This is a great way to help keep you accountable to your program and if you fall off the wagon at any stage (happens to the best of us) we will be right there to get you back on track. Health Fund Rebates Are Available on this Program. Emed’s Weight Loss Profile which involves specific Integrative Medicine Testing to identify any metabolic or nutritional factors that are putting the brakes on your weight loss efforts, including fasting blood glucose levels, lipid studies, vitamin D, high sensitivity – C-reactive protein and thyroid hormone levels. This testing profile is a great way to track your progress from the beginning of your Weight Loss Program to the end, if you wish to get retested and see how far you’ve come! Omron Body Analyser Scale – This scale is the perfect tool to help you track your weight loss progress on a weekly basis throughout your program. It provides you with a detailed analysis of your body composition and weight, including body fat percentage, body mass index, resting metabolic rate, skeletal muscle percentage and visceral fat level easily and accurately. If you have any questions or would like some more information on this program before committing to a new you, please contact one of our friendly Emed Practitioners for assistance. Are you feeling frustrated and defeated when it comes to achieving your ideal body weight? Regardless of your starting point, it’s time to try a new approach based on YOU and YOUR individual health needs!